WELCOME TO ELITISM6.COM: Our Very Own Informant Joins Race For NUISS 2018 Election. Our Very Own Informant Joins Race For NUISS 2018 Election. Our very own wireless informant, Elijah Madubuihe known also as "IMSU ELIJAH "has officially declared his intention to contest as Minister of Information in the 2018 election of National Union of Imo State Students (NUISS) expected to hold Fri. 30th November in Owerri. The one time union PRO vowed if elected, the system would turn around for timely, accurate and dependable information. Imsu Elijah is content writer, a Journalist and an editor. He is also an Ambassador of Campus Rave on orange Radio Fm 94.5, Wasaup Campus on Imsu Star Fm 90.9, Editorial secretary at IMSU star newspaper. A member of Imo State bloggers Association (ISBA) and online media practitioners association of Nigeria (OMPAN). 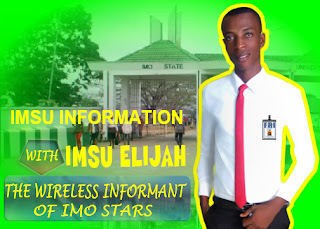 For further information about him, you can still look through his Facebook handle @Imsu Elijah.